The buddleja is in full bloom, along with the oregano, carrots and mint and with the warm sun on them, the air is full of scents and alive with the humming of bees. Five minutes in the garden with a camera and I saw too many butterflies to count, bees of all kinds and sizes and several humming bird hawk moths. Most of the butterflies will not stay still for long enough for me to identify them but there are lots in all shapes and sizes. Since I have been here I have deliberately been planting bee friendly and wildlife plants to provide both nectar and food for the caterpillars. This one did sit still for me to get a good picture, it is a swallowtail butterfly, incredibly rare in the UK but more common here. They are very large and eyecatching. This is a painted lady butterfly, I also saw peacocks and many others of all shapes, sizes and colours that I couldn't identify. 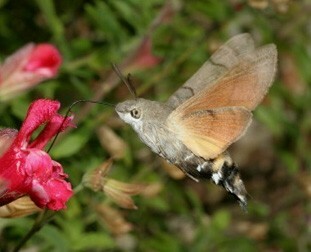 There were also several humming bird hawk moths,once seen never forgotten. Humming loudly they look just like humming birds but their wings move so fast, and they dart so quickly they are very difficult to photograph. This is a picture of one I found on the internet showing you some of the detail. I think I might be the luckiest person on earth as I seem to have found the garden of eden.